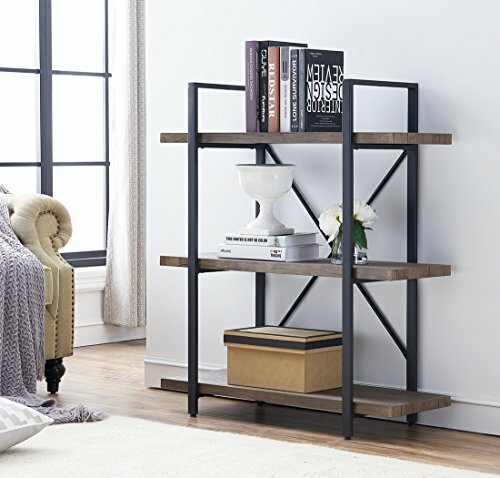 Simple design with retro style abounding in sense of art offers an industrial aesthetic feeling, this Functional bookcase is great for home or office organizing and decor! clean-lined design adds a refined touch to any space, making it the perfect addition to all kinds of retro style decoration, restaurants, cafes, office and other place. to each other to create an elegant storage wall. SATISFACTION GUARANTEE: We support 30-day free return and 12-month warranty. ★ Compliment any room: Stylish and clean-lined design adds a refined touch to any space, making it the perfect addition to all kinds of retro style decoration, restaurants, cafes, office and other place. ★ Strong Construction, Built to Last： Heavy duty metal frame combined with thick MDF board (not solid wood) design makes the shelves super stable, not solid wood. Weight capacity of each shelf is up to 70-lbs. ★ Easy to clean and assemble：Necessary hardware and instructions provided, It only takes you several minutes to assemble effortlessly.